I get a lot of questions about what types of cameras I use in my car. 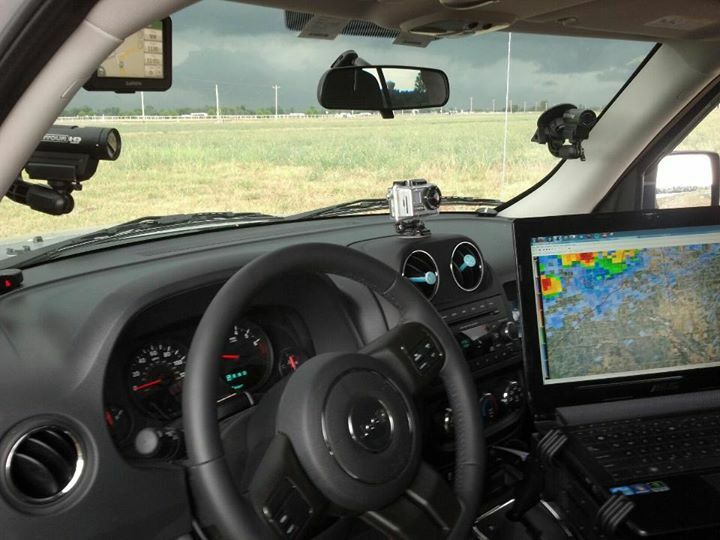 Each chaser is going to be different and their ideal camera setup is going to vary by their goals. For me, I want to capture everything. Not just what happens outside, but what happens in the vehicle as well. We all know we have some secret love affair with adrenaline, and there is no better way to look back on that and remember it, than to capture what happens inside the vehicle too. Furthermore, I like to look back and hear what I said, what decisions I made, and why, so that if I make a mistake, I can make up for that in the future. Let’s get into the details though.. Here is a list of what I have in the car. I put a picture up, but note, those are the older models of the GoPro and Contours.. I have loved this setup for a while, so I have just upgraded as they come out! I put video from El Reno below, so you can see all these in action! One is mounted on the dash, in the center, the other is hung from the mirror. I use these to get a wide view of what happens in front of us. For example, in the El Reno tornado video of May 31st, 2013, this camera captured incredible imagery of my windshield getting smashed. These cameras… I can’t tell you how much I love them… They just sit there and are ready to go at a moments notice. You slide a button to turn them on, and they fire up and record. Slide the button off, they turn off and stop using any power. Now, here is the really cool part… They have built in GPS!! You want to remember where exactly you saw that big tornado? Pull up the GPS! It plots on Google Maps inside the app and you can follow the video along with your GPS location. Super awesome! This one is personal preference. Don’t get me wrong, there are a lot better options for streaming than what I am doing. But to be quite honest, I don’t get that into the whole streaming just yet. It’s a flooded market and in my head, I would rather save my bandwidth for radar data. Anyways, I run a Logitech C920 webcam. It’s just a USB cam that goes right to my laptop. Many chasers want to use big HD camcorders so they can record in full HD also. That may be a good option, I just have other cameras I use to capture video and don’t need to do that. Yeah, I know this post was all about cameras, but I thought I’d throw one other neat thing in here.. I also have an Xtrons in dash android radio. This probably will get upgraded soon to something newer, but it’s nice to have Google maps, Radar Scope, etc right at your fingertips. Plus it’s nice for storing music, etc. Don’t watch and drive, but if you’re sitting bored waiting for storms, YouTube and Netflix work great too! Check out the cameras above at work… The El Reno, OK tornado from May 31st, 2013.